The Spitfire F Mk IXc is a Rank III gift British fighter with a battle rating of 4.3 (AB) and 4.7 (RB/SB). 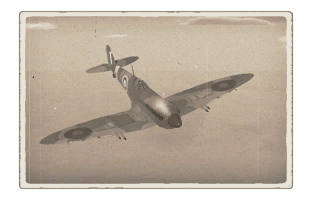 This aircraft was introduced in Update 1.77 "Advancing Storm" as a reward during Royal Air Force centenary. 3 mm Steel plate on top of fuel tanks. 4 mm Steel plate on pilot's seat. Behind pilot is another 6-7 mm steel plate. 3 mm Steel plates around ammunition. 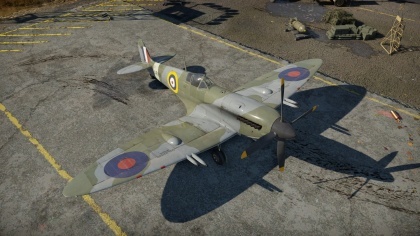 Significantly increased firepower compared to the regular Spitfire F. Mk IX at a minimal performance cost. Ammunition pool boost to 120 rounds per gun compared to the 60 rounds of predecessors. Highly maneuverable and excellent roll rate. Same armament to the Spitfire Vc albeit with a slightly more powerful engine. Very good at for Boom and Zoom and turn fighting. 20mm Cannon armament exerts significant recoil on the light airframe, forcing the plane's nose slightly downwards during prolonged fire. Poor Energy retention in sharp turns. Only one flap setting (landing), and the ripping speed is really low. Ammunition pool is easy to burn out without trigger discipline. Hispanos have a tendency to jam with prolonged firing. Light airframe, which can't withstand a lot of punishment before breaking. Suffers heavily from compression in steep dives. Poor performance at high altitudes. A leak to the cooling system of the liquid cooled engine means death in minutes. This page was last edited on 17 February 2019, at 16:36.